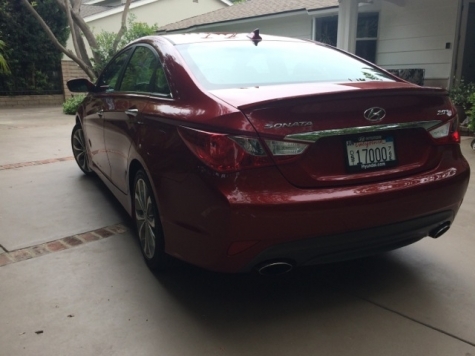 If you saw me around town last week I was driving a deep red Hyundai Sonata. It’s an attractive mid-sized sedan with distinctive swage line that adds the look of speed. 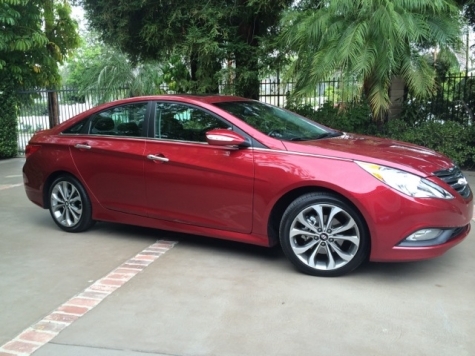 It’s just a look though, the Sonata, though very perky, is not the car you’d be racing for pink slips at the bottom of the LA River. You also wouldn’t want to be racing the Sonata at the bottom of the LA River because it’s a really fantastic vehicle that you wouldn’t want to abuse. 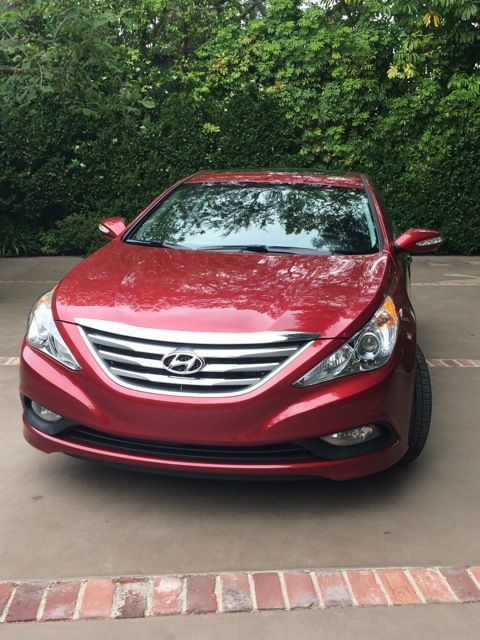 The 2014 Sonata that I drove was equipped with a 4 cylinder turbo engine. It was exceptionally perky at 274 hp and somewhere between 3,505 and 3,616 pounds curb weight. Getting on the freeway is a lot of fun and I was actually able to catch a break and the traffic allowed me to go around 85 mph where the ride remained smooth and quiet enough that I didn’t need to turn the radio up. There is a tremendous amount of space in the rear seat so this is a great option as a family car. The fact that it has rear sear air vents and dual climate controls for the front means that everyone stands a pretty good chance of being comfortable (I say pretty good because my somehow family manages to freeze me out anyhow). The Sonata is safe and affordable. When I’m looking at vehicles for the people I love safety always tops the list. It’s got an overall 5 star rating from NHTSA which is an incredible endorsement for a family car. There’s plenty of room for all, the rear seat is comfortable with our growing carpool (up to 5’10” this year!) and the trunk is enormous. 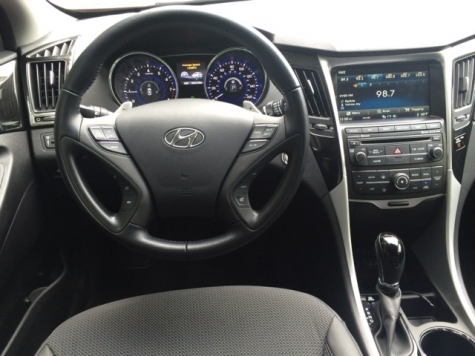 The interior of the Sonata feels like a full sized vehicle even though you’re in a solidly midsized sedan. It’s no secret that I’m a fan of Hyundai’s technology. The navigation system is intuitive and helpful, it’s easy to connect a phone and equally simple to switch between two phones. At $29,555 the car I drove came wonderfully equipped. In addition to all the safety standards like Advanced dual front airbags with Occupant Classification System (keeps airbags from deploying if you or your passenger doesn’t weigh enough), an energy absorbing steering column (you’ll want this if you’re in an accident), and remote keyless entry (my luxury car does not come with this) the Sonata also has options like the blind spot detection system, which I really appreciate. The Sonata has two flaws that you might not notice on a test drive and it’s entirely possible that they won’t be problems for you. If you have a Sonata with a sunroof there’s a little blue LED light that faces toward the front of the vehicle. If, like me, you sit upright (as opposed to reclined) it’s possible that this light will shine in your eyes at night. Had I owned this vehicle I’d have put a little piece of electrical tape on it but it wasn’t mine so I just jammed a tissue in there so that I wasn’t distracted at night. It’s not insurmountable but it’s also not something you’d be aware during a daytime test drive. The second problem is that I get in my car and drop my junk, there’s a lot of junk, on the center console. The Sonata has it’s seat warmers on the console and the buttons are really easy to press which means that more than once on a 100° day I’d be sitting in the car wondering why it was so damn hot. I suspect that this is something I’d get used to checking for. With my car the sport suspension button is in the same spot and I end up burning diesel sitting in LA traffic so this may be an issue for just me or this may be an issue you have as well. One thing that I’ve noticed about Hyundai (and I’ve noticed this because we just bought Jane a car and Hyundai was all over our list – including the Sonata) is that they haven’t really figured out how to lock buyers into leasing the way that some brands do. If you lease with them you are less likely to get stuck in a cycle of never-ending upgrades to the next vehicle where you’re factoring in your overages. Hyundai Sonata car huh impressive, as well as the detailed contours.